Alpine Metrics, utilizing Cortana Analytics, predicts sales outcomes with 95%+ accuracy. Leveraging Dynamics CRM and Salesforce, the Alpine Metrics Sales Predictions content pack for Power BI includes metrics such as potential and predicted sales and risks, allowing you deeper insight into the future of your business. This post will explain how the Power BI content pack can help you analyze your Alpine Metrics data. 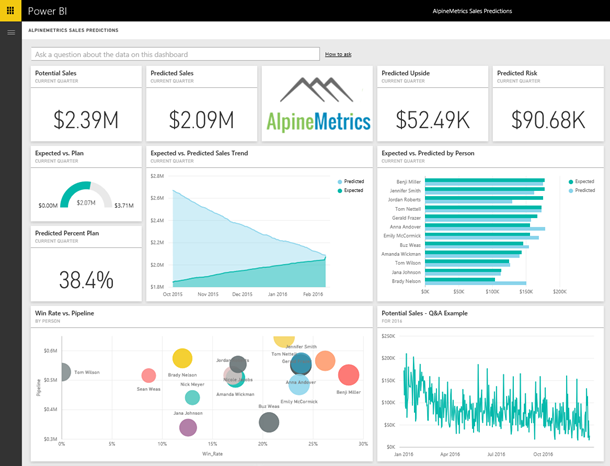 For additional details on how to get started, please see the Alpine Metrics content pack for Power BI help page. It’s easy to get connected to the content pack! Just sign into your Alpine Metrics account, and once the connection is completed Power BI will automatically create a dashboard, report, and dataset with data from your Alpine Metrics information. The out-of-the-box dashboard offers a set of insights and you can select any of the tiles to drill into the 7 pages of reports. The report below is an example of what you'll see after connecting to your Alpine Metrics account. Once you have loaded a report, you can hover over the visualizations to see additional information. Select a visual to see more details. In each report you can switch to edit mode, where you can edit or add additional visuals to your reports. On the left you’ll see a list of all the tables and fields you have access to in the content pack. You can also try asking a question of your data by using the natural language processing found in Power BI. Selecting the question box at the top of the screen will provide a list of suggestions, or you can type your own, such as “show amount by close date for 2016”, to see all of the opportunity amounts that are closing in 2016. From any reports or results you can pin visualizations and tiles to the dashboard by hovering over them and selecting the pin icon. You can choose your destination dashboard, allowing you to customize and collect from multiple sources. After the initial import, the dashboard and the reports continue to update daily, and you can further control the refresh schedule on the dataset. 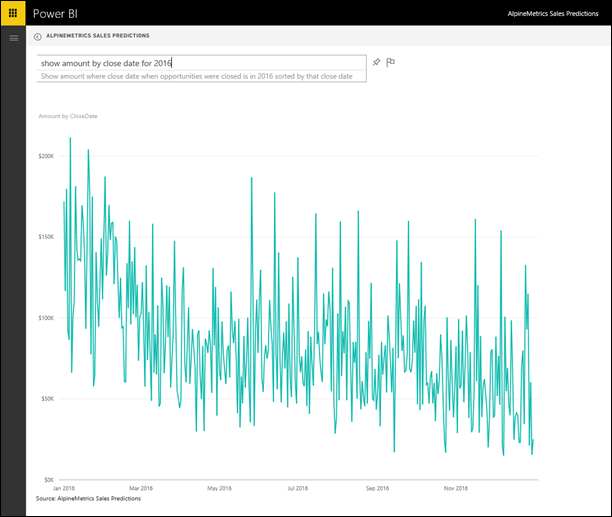 With the Alpine Metrics content pack for Power BI, you have an initial set of insights that you can use to explore your data even further. We’re always interested in hearing your feedback – please contact us at http://support.powerbi.com to let the team know about your Power BI experience and if there’s anything we can do better. We look forward to your feedback!